My Etsy shop update is finally done! 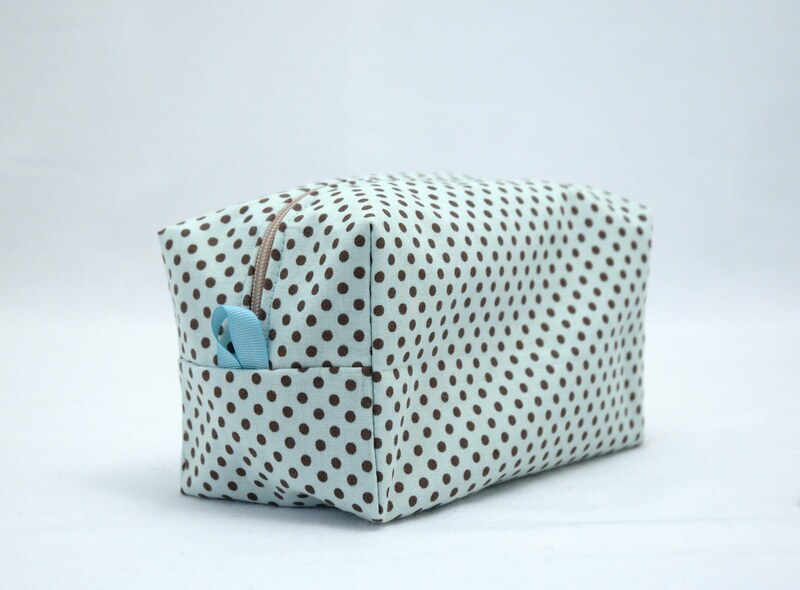 You can find kits here, and zip pouches here. I know the Mama and Baby bunny kits are a bit pricey, but there's a lot of stuff in them! I half thought to separate the Mama and Baby supplies so the cost would be more reasonable, but since the patterns come together, it made sense to sell the kits together. As always, the patterns are sold separately from the kits because so many of you already have the patterns (saves us both the trouble of a Paypal refund). I'm really happy with this batch of pouches too. 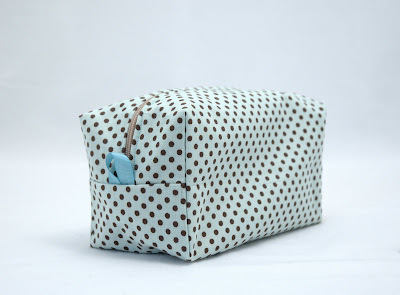 I usually want to keep at least one, and this time that turquoise with brown dots is really calling me (good thing I have more of both those fabrics)! However, I am running low on nice fabric, so it might be a while before I have a chance to sew some more. As the weather warms up here, and there are so many things to do outside, I will likely be writing here less and less. But I'm sure you're all busy too! I love this time of year, with the sunshine and rain, the fresh green leaves, and all the noisy birds. It's been exciting to introduce the outside world to Lev - last year he was really too young to do much more than pull up grass to put in his mouth. Plus, I have new flower and veggie gardens to watch and fuss over. Once things start to flower I'll have to get some photos to share. In between the playing, gardening, visiting, and knitting I've done this past week, I did manage to fit in a bit of time to make some more kits for my Etsy shop. I've got 2 Mama and Baby bunny kits, 2 Owl and Baby kits, and a Pug kit all made up, just waiting for me to get photos. Plus, I have 6 zip pouches I sewed weeks ago. I had all this planned for a big Mother's Day shop update, and I'm glad my planning worked out for once! I'll be sure to post here when everything is in the shop and ready for you. Anyway, with the sunshine peeping out between the showers, I think I need to dash outside for a bit of gardening. I hope you're all enjoying your Sunday in the ways you like best! Yesterday got away from me a bit, and I forgot all about the post on lambs from our KAL! However, I do have a freshly dug veggie garden; and the post will be enjoyed just as much today, I'm sure. 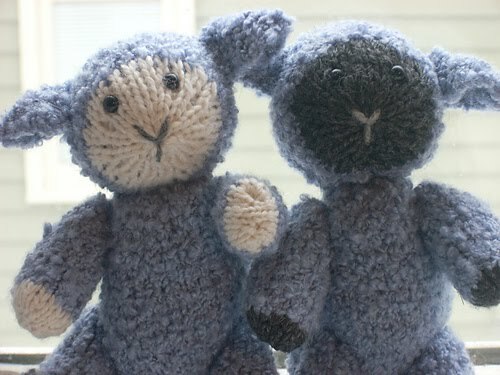 First, I have to share with you a pair of curly grey lambs by amybd. I think these cuties are going to have a lifetime of snuggles! 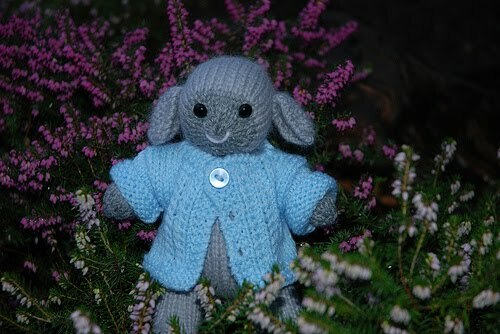 Next is a very sweet lamb in a cozy blue cardigan, by yarngirl69. She looks quite at home in all that pretty heather. Here is a lovely lamb by patologica. He looks so proud of his fuzzy fleece and pretty flower pin! 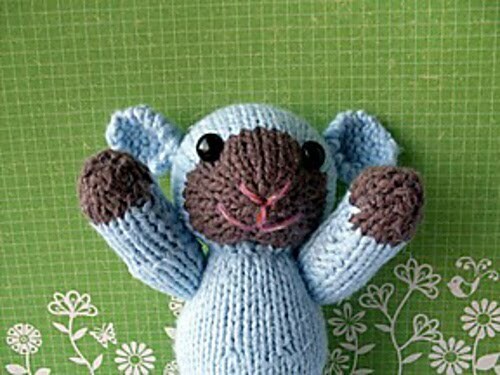 This blue lamb by ilovewool looks like he's cheering on Spring! I hear you, little guy, the flowers and leaves can't come fast enough for me. 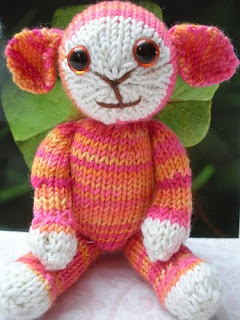 And last is this stunning lamb by corien. Toys like this are one of the major reasons I don't list any yarn brands on my pattern. If I tried to restrict what type of yarns knitters use, I might never get to see beautiful results like this! By the way, if you'd like to knit a lamb yourself, you can download the pattern for free. We had a lot of fun with the Spring Knit-Along, over on Ravelry. It's been over for a week or so now, but I thought it was a good time to show off some of the toys that were made. Today is for bunnies! 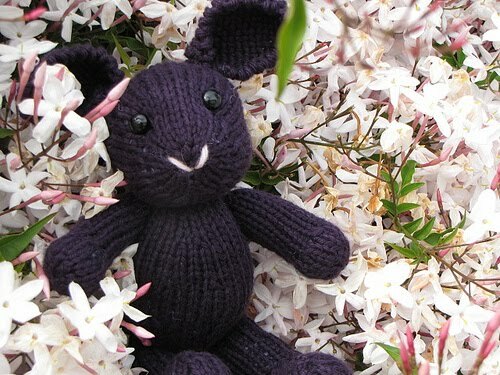 This is Blackberry Bunny, by froggyster. She looks very cozy in those fluffy pink flowers. 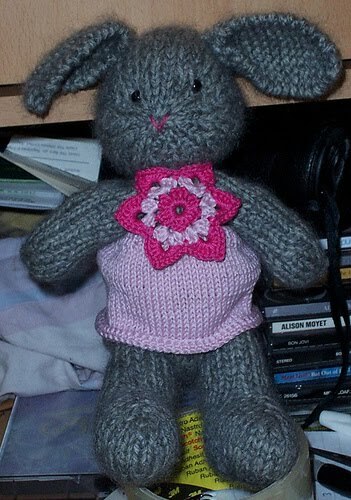 Next is this sweet and fuzzy bunny by stitchingdragon. It reminds me of all that fuzzy yarn in my stash, which is waiting to become fuzzy bunnies. wrchili knit a pair of Mama bunnies in pink, and they're both so adorable and cuddly, it makes me want to knit the pattern again, in something more interesting than brown or grey. This little bunny by bluesocks is all ready for Spring in her cherry-blossom pullover. And the last one for today is this Scraps Chaps bunny by Je55ie, who looks like he got a little too close to the Easter egg dye!